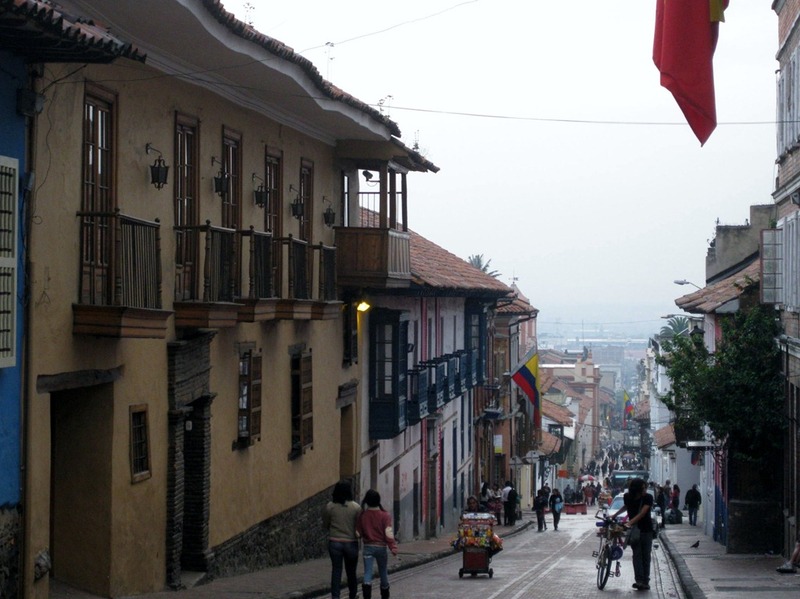 La Candelaria is the partially preserved colonial sector where the city originated. 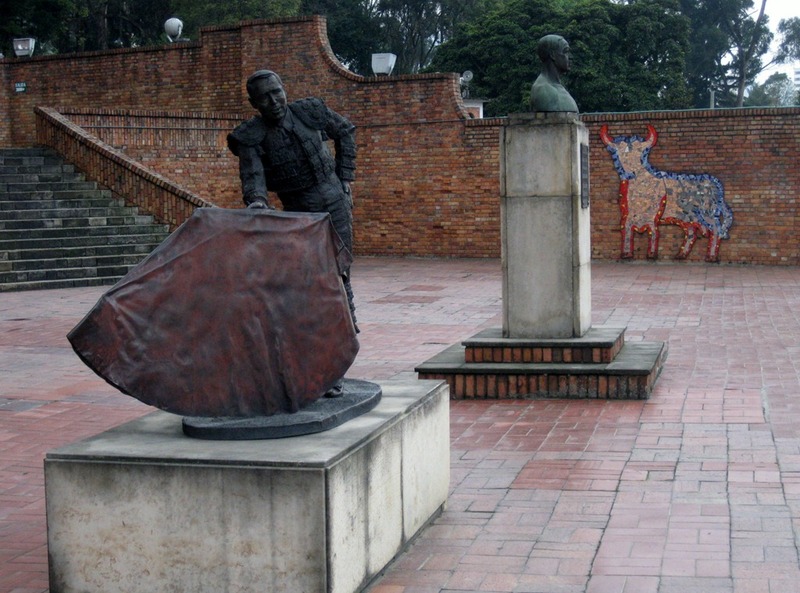 The center of La Candelaria is the Plaza de Bolivar, a large open plaza with the obligatory monument to Simon Bolivar. 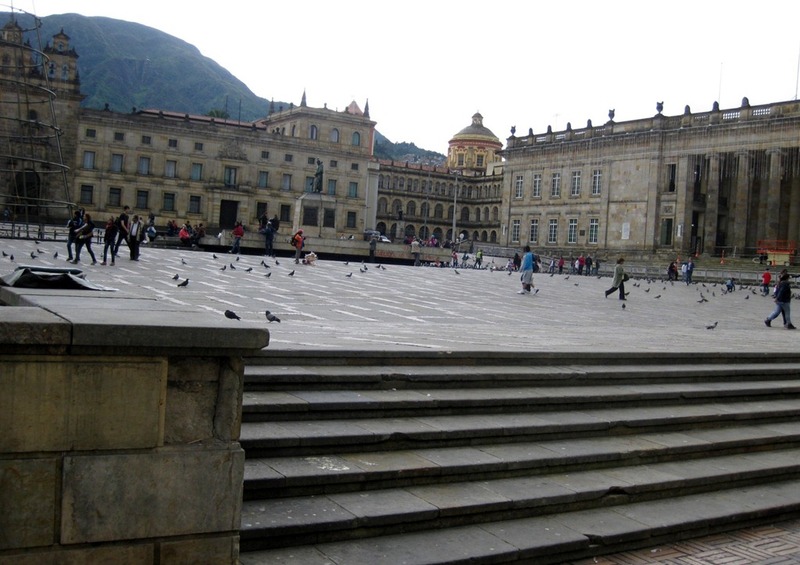 Around the plaza is the Palacio de Justica and the Capitolio Nacional (the home for Colombia’s congress) behind which is the presidential building, Casa de Narino, the equivalent of our White House. The plaza is a very lively place. During one of our visits, there was the usual collection of vendors selling ice cream, others offering instant digital photos with your choice of background, ladies selling corn for feeding to the hordes of pigeons hanging around the place waiting for tourists to feed them (and have your photo taken surrounded by pigeons, no thanks), a man with a llama for photo ops, a small group chanting some political message and a ceremony near the Palacio de Justica to honor a member of the police force recently killed in the line of duty. On our first visit to the plaza we were approached by a somewhat grizzled older man who spoke fairly good English, claiming to have lived in the US for a time, who began telling us about all of the buildings surrounding the plaza and some other nearby points of interest. I expected a hard sell for a personal guided tour but as we were leaving he only asked for a contribution which we gave him. He was respectful and informative. If I haven’t mentioned before, we have found the people in Colombia to be very friendly, welcoming and helpful. They will tend to continue speaking Spanish to us even after establishing that we are not fully understanding them, but it’s generally in an effort to help us. We are frequently asked what country we’re from and if we are enjoying our visit to their city and to Colombia. Among our touristy activites: visits to some of the museums in La Candelaria, including the Museo de Policia, a surprisingly interesting tour of the history of the Policia Nacional de Colombia including a display about the killing of Pablo Escobar in Medellin; a city bike tour, including a visit to the Plaza de Toro, the Bogota bull fighting ring; the ride up Cerro de Monserrate (see more below); a Sunday walk along Carrera 7, part of the 120km of streets that are closed to auto and bus traffic on Sundays; a stroll through Parque Nacional, a lovely city park. 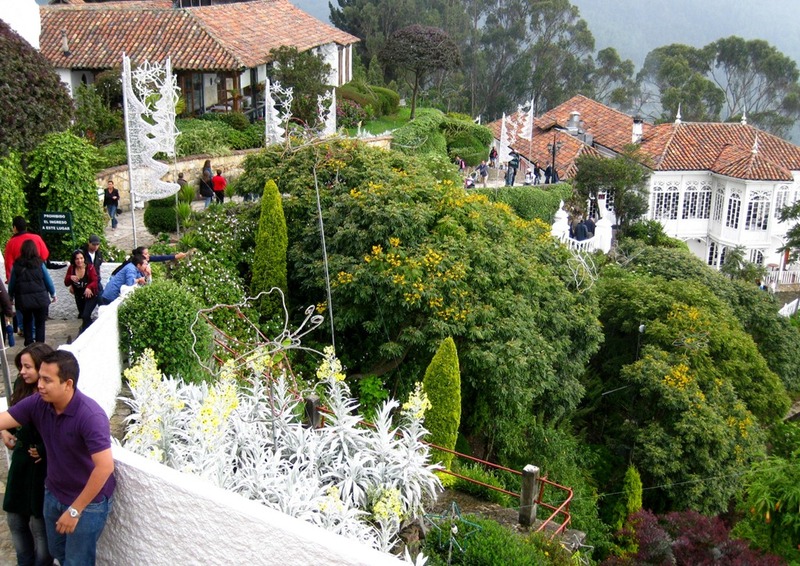 Along the mountains that dominate the eastern edge of Bogota, the peak of Monserrate rises some 600 meters above the city at 3152 meters, about 10,300 feet . The white topped church sitting on the hill can be seen from most anywhere within the city. To get to the top, there is a teleferico (cable cars) and a funicular. We chose to visit Cerro de Monserrate on Sunday which is the most popular day for this activity. We went on Sunday because the cost is reduced on that day and it was convenient for other activity we had planned in that direction. We rode up on the teleferico and came down on the funicular. The views from the top weren’t ideal due to low clouds and a haze over the city. While we’ve been in Bogota the weather has been generally cloudy with some rain each day with daytime temps in the mid-60’s. Up on Monserrate this day it felt much cooler and we had a short period of rain while there. We enjoyed our visit to Bogota, recognizing that we really saw very little of it. We were given more warnings about street crime in Bogota than elsewhere in Colombia but pretty much everywhere we went there was a fairly obvious police presence. Early on Tuesday, November 8th, we took a taxi to the Bogota airport for our return to LA. After 4 months I was looking forward to getting back for a bit and reconnecting with friends and family. Colombia is a very lovely place and we look forward to an opportunity to return for another visit. What a wonderful experience, all the way around. Thank you so much for sharing such detailed descriptions and photos. I know that you’re relieved to be back home for awhile. Looking forward to seeing y’all. It’s below 60 degrees here, for sure. It would take you guys 3 years to see all of the 1000 neighborhoods in Bogota if you spent just 1 day in each neighborhood. Maybe on the next trip you can travel around the bug and weather schedule. Everything sound great except for the bugs and the high humidity. You should try the arctic or antarctic in the summertime. Have a nice rest from your travels. It looks beautiful! Be safe! Did You love Colombian Cumbia music?